Disc 1: your Enter button "Special Features" then press your Enter button the "Commentaries" section. Scroll down to the bottom and arrow left. The Spider-Man logo will appear on Harry's shirt. Select it for a blooper reel. your Enter button "Special Features" then press your Enter button "Character Files". On the second page of each actor's filmography (except Cliff/Uncle Ben), highlight their name and press your Enter button for information on the characters from the comic books. 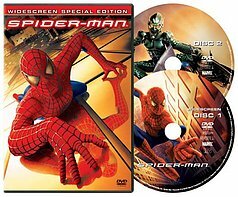 Disc 2: your Enter button the "Web of Spider-Man" then press your Enter button the "DVD-ROM" section. Scroll down and highlight "Web of Spider-Man". A Spidey face will appear. Click on it for an interview with Todd McFarlane. your Enter button the Web of Spider-Man then press your Enter button "Evolution of Spider-Man", then press your Enter button "Rogue's Gallery". Press your Enter button on any character for additional information. your Enter button the "Web of Spider-Man" then press your Enter button Evolution of Spider-Man, then press your Enter button "Rogue's Gallery". Select the picture of Dr. Octopus and press your Up button to highlight the Spider-Sense above Spidey's head. Hit enter to see The Sinister Six. your Enter button the "Web of Spider-Man" then press your Enter button "Evolution of Spider-Man", then highlight "Artists Gallery". Press right to select The Rominas at the top right of the menu. Hit enter to see a video clip. In the Rogue's Gallery section, scroll through the characters and on Scorpion and Electro, you can see 3D models of the characters by pressing the down arrow when you highlight the spidey face and click on the Venom icon that apears.